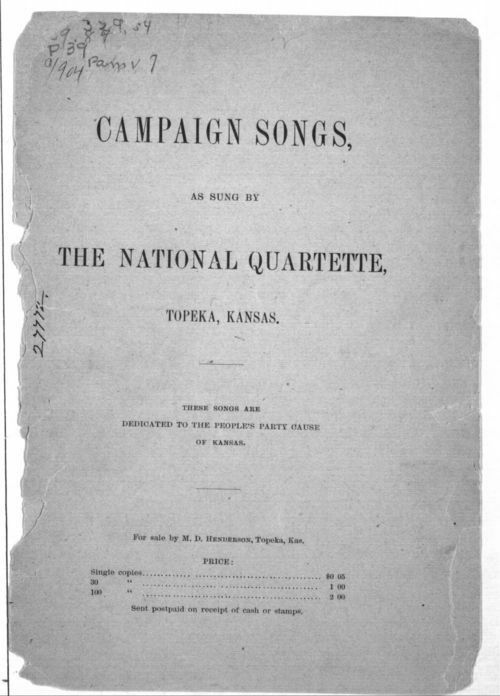 This volume of campaign songs includes four pieces that vividly express the major beliefs of the Populist Party. The first song, "For Trampling on the Grass," criticizes the businessmen and bankers who were trampling on the rights of the common people. The second song, "The Republican's Lament," pokes fun at the Republicans who were no longer able to dominate the Populists now that "they have ceased to head our whippings, and have ceased to take our word." The third song, "The Wall Street Badge" describes how the government, according to the Populists, was now in the hands of Wall Street. The final song, "One of His Legs is Longer Than It Really Ought to Be," provides a comic perspective on some of the upcoming elections, including the race between Chester I. Long and "Sockless Jerry" Simpson. Any of these songs would serve as an excellent introduction to Kansas Populism because they quickly and vividly encapsulate the main arguments made by Populists and Farmer's Alliance members.